Better known as City of a thousand caves, Pacitan in East Java, in fact, has many beautiful beaches that are very tempting faith. One of the beaches you should not miss while on a vacation to Pacitan named Srau Beach. Srau Beach located in the hamlet of Srau, Candi village, Pringkuku district, Pacitan of East Java. Almost all the beaches in Pacitan has white sand with waves big enough. No exception this one beach. The waves on Srau Beach as a fitting place for surfing. Not only local surfers are often showy action here. Also many foreigners who come to the beach for surfing. Besides the big waves and soft white sand that is so tempting, the other attraction of Srau Beach worth to explore. The coral hills that embellish the views of the beach. If the water is receding, we can also walk to the rocks to find the best photo spot. The existence of coral hills on Srau Beach is divided into three parts. The part of the beach that can be used to play around water and sand is the most western part. On the west coast there is a source of fresh water. 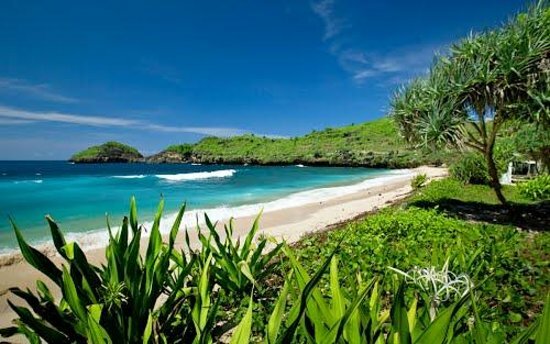 Srau Beach is approximately 25 km from Pacitan town. It took approximately 1.5 hours using a motor vehicle to get to the location. The location of the beach is still hidden, not even known to many people. Very fitting for you who love deserted beaches. For you who loves camp, Srau Beach also a very suitable place for fun with friends while camping. The vicinity of Srau Beach no official accommodation. If you want to stay, you have to stay in a tent, or you can stay in locals house are around the beach. Besides you can enjoy the sunset moment when the weather is sunny. Please come to Srau Beach how beautiful sunset here.